Taking thorough measurements of your dog is essential for choosing the correct harness size. Place four fingers behind the front legs to find where to measure the chest (girth) for harness sizes 0, 1, 2, 3 and 4, three fingers for size Mini-mini and Mini and two fingers to take measurements for sizes Baby 1 and Baby 2. The chest circumference should be measured where the strap is supposed to be located. Choosing the correct size ensures maximum freedom of movement and protects the neck and shoulders. Dog harnesses manufactured in Europe are recognizable by their well-thought-out and robust design. The reflective elements ensure safety, the skin-friendly lining provides comfort, and the useful accessories add versatility. All of our harnesses come with phosphorescent, interchangeable patches. There are more than 1000 labels to choose from, but You can order a unique label as well. Reliability and durability are ensured by the first class materials and careful manual production. The replaceable side labels were invented by Julius-K9 (1997-2003). When You buy a Julius-K9 harness, you receive a pair of side labels with the text „Julius-K9”. So you get one of Europe's most popular dog harnesses with our phosphorescent logo. The labels are attachable by hook and loop fastener. The harness also functions as a high visibility vest. Reflective materials are used on the adjustable chest strap and the edging. So the dog is highly visible from a long distance at night as well. Side bags are practical for carrying documents or treats. They are available in different sizes and colours. Torches and side bags can be attached simultaneously. The accessories are not part of the dog harness. There are more than 1000 side labels to choose from. If You do not find a suitable one, You can order a unique label as well. The label can refer to the actions of the dog, or it can be informative, funny or thought-provoking. 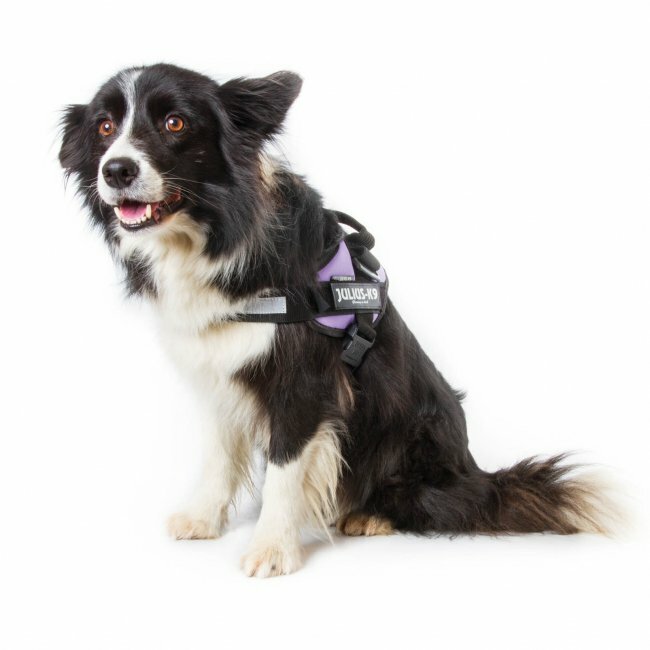 When the dog is not led on a leash, on the Julius-K9 harnesses the handle and/or the central ring can be closed by means of a rubber strap. This way the dog can be prevented from getting caught up. The harnesses were subjected to an independent, certified quality test by „Crashtest”. In the course of the test a tensile strength of 300 kg was achieved, then the buckle opened, but the harness itself did not break. The Oeko-Tex lining used for all Julius-K9 harnesses meets the highest standards. Breathable and skin-friendly. In contrast to a collar, the pulling force of the dog is distributed on the chest, so there is no pressure on the neck. *Dog harnesses size „Baby 1” will be sold with 80x20 mm sized patches. The quality control of the materials and of the products is made by Budapest University of Technology and Economics. One of our dear Boston Terriers, Frick, who we had rescued along with her brother Frack, had a heart episode at the end of November. We were preparing to euthanize her, but once at the University of Florida Veterinary Hospital, they were able to save her life by implanting a pacemaker and giving her a new lease on life. Due to the pacemaker, she can no longer wear a collar but the Julius K9 harness was absolutely the perfect option. We even chose to have written on the patch "I HAVE A PACEMAKER" - which is important for any future vets to be aware of and to make it aware to avoid any impact or trauma in her neck area. The harness fit perfectly, was almost as cute as she is, and was a gift while taking her back & forth to treatment & checkups. Thank you for a good product and thanks to God for Frick's recovery! A robust and well thought out product, much superior to similar product I have bought from other manufacturers. Easy sizing and a good fit in actuality. Delivery was swift.